Vicki's really given us a stunner for this week's Muse challenge, hasn't she? I thought about the vellum strip/sentiment but decided against it in the end. The card told me it was done and I always listen to the card! lol! There is still some time for you to play along with us - the deadline for this challenge is Monday at 8 am. At that time you can vote for your 3 favourites (even if you didn't link up a card) until Tuesday at 8. Results of the voting will be posted Tuesday at noon. Way to listen to the card Ardyth. This is stunning. Stunning, absolutely stunning! Love the gold against the black! Totally agree with skipping the vellum strip. 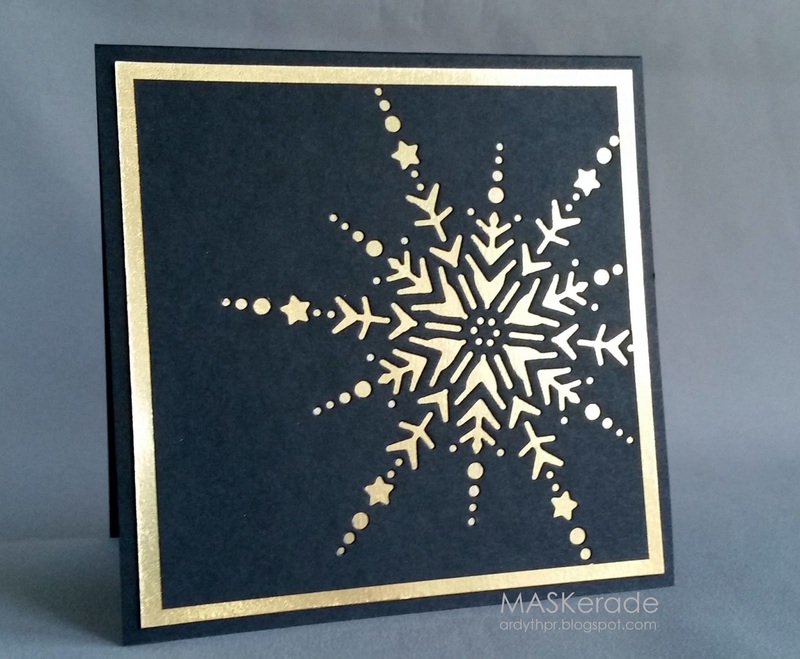 Wouldn't want to steal the limelight from that gorgeous, shimmery snowflake! I'm sure you found tons of other stuff to do rather than piecing together nine million snippets of paper! I bought this die in the summer, love it! You have made it shine!!! great take on the musecard! I love it! This is absolutely stunning, and you were so smart to use it as a negative die. I love that you listened to your card. I think the card was right--it is done and perfect, too. I don't blame you for skipping the whole inlaid thing - that looks like it could be a part-time job! In any event this is gorgeous. The black and gold make a stunning, and elegant, combination. Wow, that is an amazing snowflake!